I hope you are all doing well and have had a fabulous weekend! I seriously can't believe that it is almost Christmas...it has just come round so fast this year. I absolutely love the festive season and I love nothing more than going out and buying all the wonderful people in my life something special...plus, I absolutely love wrapping presents. The last two Christmases I worked on a Chanel counter and I must have wrapped over 100 perfume bottles and I never grew tired of it...I just love making things look presentable and pretty! I thought today I would share with you a little treat from the Neom Christmas Collection that I think you are just going to adore. 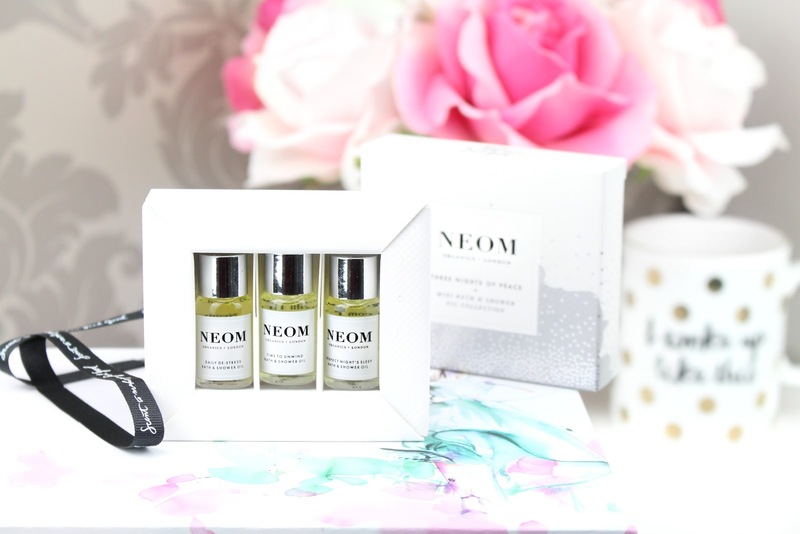 NEOM are a brand I have always admired and the few products I have tried from their range I have always been incredibly impressed with. To me, their products always seem so classic and I adore how everything is organic with the combination of having glorious holistic properties due to the high essential oil content in the scents. As a brand, they strongly oppose using harsh ingredients and want to be able to offer a beautiful collection of 100% natural fragrances for the mind and body, that are free from artificial ingredients, all with therapeutic benefits. Every scent has been designed to make you feel good and that is something I absolutely love about the products they offer. The Three Nights of Peace Mini Bath & Shower Oil set* is a collection of three beautiful bath oils made with the highest percentage of the purest possible essential oils, which not only smell wonderful but have true therapeutic benefits for the mind and body. Combined with skin soothing organic safflower and vitamin E, your skin will be left gently scented and perfectly soft. To use simply pour the contents of one (or how much you would like) bath oil into a warm bath before getting in and relaxing. As the aroma fills the room, breathe in through your nose for 7 seconds and out through your mouth for 11 seconds and repeat 3 times. The essential oils will be absorbed and the therapeutic effects will begin to work. Have no fear because you can also use these little beauties in the shower as an extra bonus. Add a small amount of the oil to your decolletage when entering the shower to create the most perfect scented shower experience. I also love doing this whilst I am at my desk at work or home to help me wind down after a long day. The first Bath & Shower Oil in the collection is the Neom Scent to Instantly De-Stress which is part of their therapeutic range. With 24 of the purest possible essential oils including lavender, jasmine and Brazilian rosewood, it has been expertly blended to help reduce stress levels. The second Bath & Shower Oil in the collection is a 100% natural Neom Time to Unwind fragrance which is also part of their therapeutic range. With 9 of the purest possible essential oils including guaiacwood and rose, the oils in the fragrance have been blended to help you unwind and focus. This is one of my favourite scents and I love placing a small amount on my neck whilst working at my desk to help me get into blogging mode and unwind from a stressful day. The third and final Bath & Shower oil in the collection is their tranquility scent which is part of the therapeutic Neom Scent to Sleep range. I have the Perfect Nights Sleep Pillow mist in this scent and it has grown to be my favourite out of the entire range - you can see my full review here. This range is curated from 19 of the finest and purest possible essential oils including English lavender, sweet basil and jasmine, all sourced for their unbeatable sleep-inducing properties. Overall, I was extremely impressed with this gift set and for £14.95* I think it is totally worth it for the quality you are receiving. You also receive a free voucher code to download the Neom Ultimate Sleep eBook which is originally worth £9.99. The expert-led eBook is packed with tips and advice to help you understand the science and the art behind great quality and quantity of sleep. I have downloaded mine and I am completely hooked, I definitely need advice when it comes to sleep as my patterns are everywhere. The packaging is super adorable and I love how compact it is without wastage. The overall design fits in nicely with the entire Neom line, however, I adore the added touch of silver sparkles for a more Christmassy feel. As the name suggests these oils are supposed to last three nights, one Bath and Shower Oil per bath / shower per night - I sometimes wish they were a little bit bigger so they would last a little longer, however, it all depends on how you use them. Also, this set is a great way for you to introduce yourself or someone else to the line before committing to the full sized versions. I just love mini products! I hope you all enjoyed this Christmassy post, I would love to know your thoughts on the Three Nights of Peace Mini Bath & Shower Oil Collection. I think they would make a lovely gift or stocking filler this festive season and you still have time to get yours orders in before Christmas! Like always lovelies, if you have any questions, requests or if you just want a chat you can contact me on my social media or leave me a comment below. I love hearing from you all and I make sure to read every single comment…they really make my day! 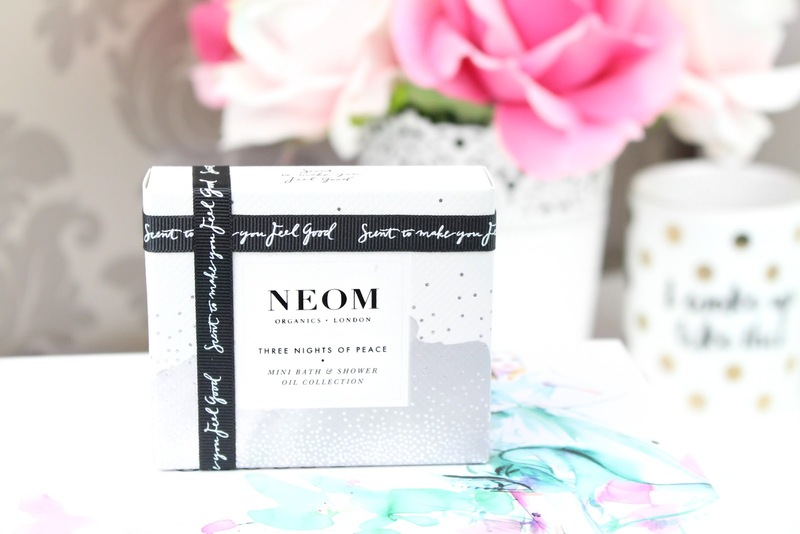 Would you give the Neom Three Nights of Peace Mini Bath & Shower Oil Collection a try? You can check out the full Christmas Collection here.